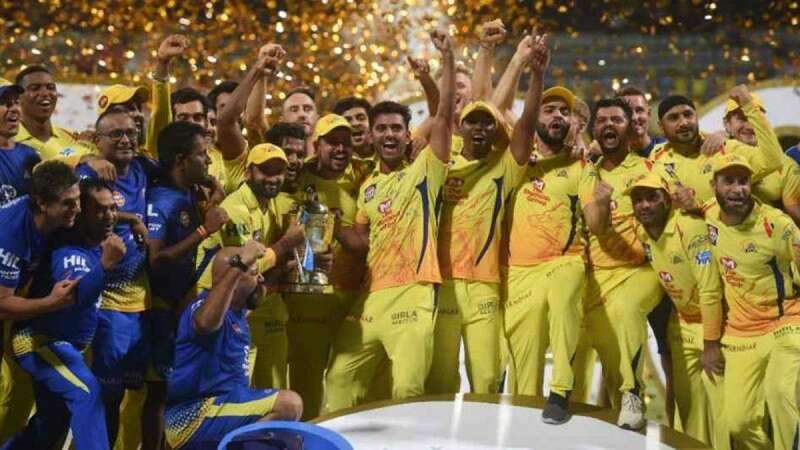 Mumbai : Shane Watson was back to his brutal best as the opener's scintillating unbeaten 117 runs helped Chennai Super Kings lift their third Indian Premier League (IPL) title, thrashing Sunrisers Hyderabad by eight wickets in the summit clash here on Sunday. Making a comeback after serving two years of a ban, the Yellow Brigade stood up to their reputation of being one of the best team in the cash-rich league. The Mahendra Singh Dhoni-led side hunted down a competitive 179-run target against one of the best bowling attacks of the current season with nine balls to spare. Watson was in devastating touch in his entire 57-ball innings, which comprised of 11 boundaries and eight massive hits into the stands. The Australian along with Suresh Raina (32) forged a 117-run match-winning partnership to put Chennai ahead of their opponents. Chasing 179, Chennai lost their first wicket in the fourth over as Opener Faf du Plessis (10) was caught and bowled by pacer Sandeep Sharma when the scoreboard was reading just 13 runs. Raina then joined Watson and the duo started slamming bowlers all round the park at will. The strike mostly remained with Watson and the Australian all-rounder took advantage beautifully by unleashing some ferocious shots. Soon the duo helped their team get past the 100-run mark in the 12th over and just after that Watson, who was looking at his best, hammered Sandeep to 27 runs in his final over. Trying to join the party, Raina miscued while trying to pull a short ball from Carlos Brathwaite knicked his gloves which landed in wicketkeeeper's hand. The southpaw's 24-ball knock was laced with three boundaries and one six. The fall of wicket brought in Ambati Rayudu (16 not out) who followed the same strategy of giving the strike to Watson. Soon, the Australian slammed his second century of the season off just 51 deliveries through a single off Rashid Khan. With Chennai needing 21 runs in 20 balls, the duo kept on playing freely and overhauled the target with ease to become the only team to beat a side four times in a single season. For Hyderabad, Carlos Brathwaite and Sharma took one wicket each. Earlier, put in to bat, Yusuf Pathan's unbeaten 45 runs off 25 balls along with skipper Kane Williamson's 47 helped Sunrisers Hyderabad post a competitive 178/6. In a batting friendly track at the Wankhede stadium here, Yusuf, who came when the scoreboard was reading 101/3, played a good knock to propel Hyderabad to a good total in their 20 overs. The Baroda batsman's unbeaten innings contained four boundaries and a couple of hits into the stands. Put in to bat, Hyderabad started their proceedings on a bad note as opener Shreevats Goswami (5) gifted his wicket in the second over with the just 13 runs on the board. Opener Shikhar Dhawan was then joined by Williamson and the duo stabilised Hyderabad's innings putting on a 51-run partnership for the second wicket. Left-arm spinner Ravindra Jadeja broke the partnership in the ninth over as he clean bowled Dhawan on 26 runs. Shakib Al Hasan then took Hyderabad's innings forward with his skipper as the side crossed the 100-run mark in 11.5 overs. However, in a desperate attempt, Williamson came down the wicket trying to play big, but the ball drifted away and then Dhoni did the rest behind the stumps. Williamson's fall bought Yusuf in the middle and the right-hander made clear his intentions from the very beginning, smashing a boundary in the second ball he faced. But when things seemed good in the middle, Bravo packed back Shakib (23 off 15) in the 16th over, leaving Hyderabad at 133/4. Incoming batsman Deepak Hooda (3) fell cheaply in the 17th over which saw Brathwaite joining Yusuf. The Baroda batsman then accumulated 34 runs for Hyderabad with Brathwaite in the remaining 18 deliveries to help their side reach a competitive total in the mega final. Brathwaite, who fell in the final delivery of Hyderabad's innings, chipped in with a valuable 21 runs off 11 balls. Brief Scores: Sunrisers Hyderabad 178/6 (Kane Williamson 47, Yusuf Pathan 45 not out; Lungi Ngidi 1/26) vs Chennai Super Kings: 181/2 (Shane Watson 117 not out; Carlos Brathwaite 1/27).